My casual on and off yoga practice of the last two years has recently turned a dedicated corner. During this time, never did I think Bikram was the type of yoga I was interested in. Stick myself in a room of over 100 degrees for 90 minutes doing garurasana (eagle pose) and the like? Britney knows how I feel. 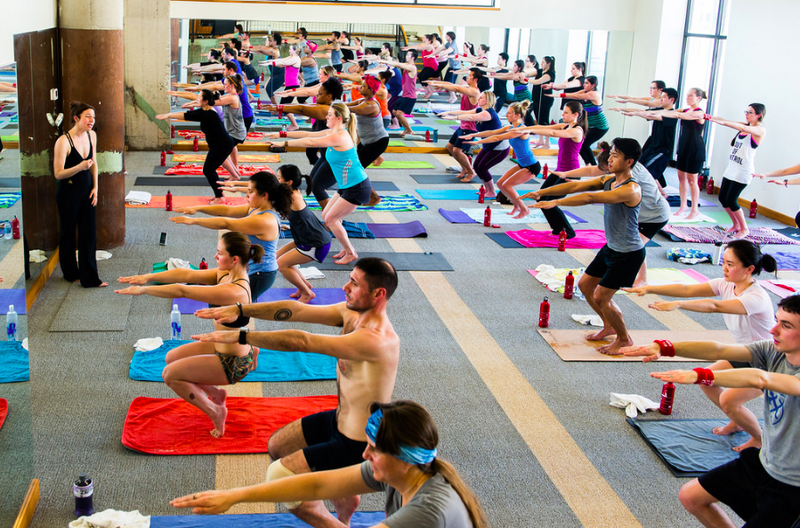 But when Yelp put together a Bikram event at a Midtown studio, I jumped at the chance. If I wasn’t ever going to do it on my own, might as well do it via a free event to see what the fuss was about. Bikram is no joke — not that I thought for a second it would be easy. There’s really no way of mentally preparing yourself for the grueling 90 minutes other than making sure you’re hydrated beforehand. I’m bummed that I didn’t make it through the entire session. But if there’s one thing I learned through yoga, it’s not to compare myself to anyone while on my mat and to listen to my body. During the first half of the standing poses, I was doing rather well. You might say I even surprised myself. Check out that fierce concentration. Then we had to transition onto our backs before the sitting poses, and that’s when my surroundings started getting fuzzy, my breathing became labored and I could feel a migraine starting to settle in. Halfway through, I was only doing half the poses, and then when we had to fold forward, I felt like I was going to pass out. I made it out of there. One of the teachers told me afterward that your blood pressure drops when you lie down after all the work that you put in. How is that safe and good for your body? Are Bikram’s health claims actually beneficial in the long run? I don’t think of my non-desire of Bikram to mean I can’t toughen it out, although it’s easy to view it that way. There’s a time and place not only to pull back but also to push yourself. I find that on my mat daily — at room temperature, and it’s a beautiful thing. Love hot yoga! Just signed up with a Bikram studio that does other styles as well. Will have to work my way up to the full 90 minutes as I have done this previous years and was so intense! I’m impressed you tried hot yoga in the first place! Thanks, me too!! It’s one of those ‘maybe everyone should try it at least once’? But you’re not missing anything if you don’t.